30% of mobile users uninstalled an app after discovering that it was collecting personal information that they didn’t wish to share. 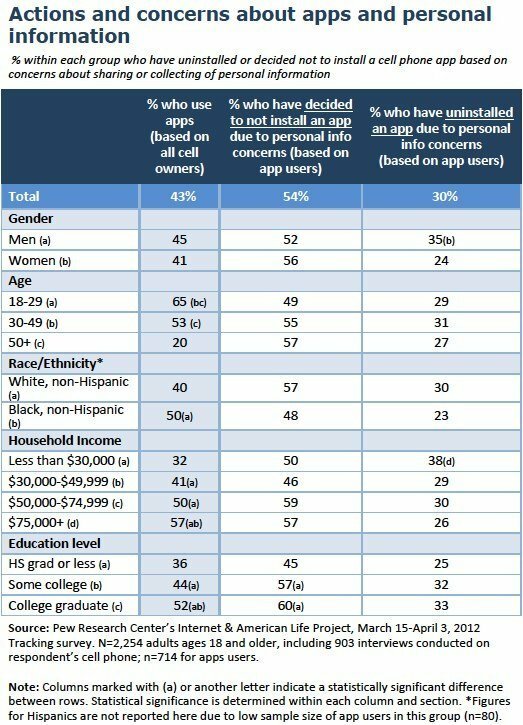 Owners of Android and iPhone devices are also equally likely to delete (or avoid entirely) cell phone apps due to concerns over their personal information. Interestingly, younger cellphone users were also twice as likely as older users to report that “someone has accessed phone in a way that felt like privacy invasion.” This poll follows another survey by Pew that found that users were becoming more active in managing their social media accounts. This is definitely a positive trend that I am following. There is however a serious artificial obstacle I’ll point out. It is the smartphone network carriers control over our devices. Isn’t it interesting how you are required to purchase hardware which is yours but you cannot manage the bundled application on it? The carriers deliberately prevent you from uninstalling their bloatware and spyware. For instance, my Verizon Android based phone comes with several applications that are related to other companies such as Amazon’s MP3 or Kindle services and Blockbuster’s movie application. Did you know that these applications are granted permission to retrieve your sensitive log data? Why are any of those applications relevant to Verizon providing me with connectivity that I pay for? Rhetorical question I know! There is action we can take as consumers to protect our privacy and gain legitimate control over our property. File an FCC complaint? I did and we shall see what they say about it. The reference number is 12-C00424348 by the way. Root your smartphone? This may be too technical for most but it does give you absolute power of your hardware. The carriers will void your warranty and banish you from their kingdom should they discover that you have done so. I cannot confirm nor deny that my smartphone is rooted. Remain the victim? It’s never my choice but you might resolve yourself to accepting the carrier induced fate and hope that they don’t mishandled your personal and sensitive information. Here are some more details from the survey; enjoy! Verizon did indeed respond to my FCC complaint as I predicted they would. The carriers seem to actually respond to FCC complaints expeditiously and that mechanism has become the stone in my David vs Goliath repetiteur. My FCC complaint was focused on my privacy and less about being forced to accept bloat-ware on my hardware. I started with one of Verizon’s elite problem solving case workers who quickly realized two things. First, that her continued efforts to warp the issue from a personal privacy and security complaint into a consumer tear about bloat-ware. Nice try, but I was not born yesterday! Her second attempt was to bring into the call a bubbly “senior” technical support representative who could assuage my concerns with his lofty techno-babble. Nice try again and once I permitted him time to state his case, I pounced. Allows the app to connect to and disconnect from Wi-Fi access points, and to make changes to configured Wi-Fi networks. Now, the Verizon representative did his best authoritative impersonation and continued to assert that even though the end user is forced to accept the application conditions, that there is no cause for concern. The applications must be actually used before any of my concerns might actually be validated. Now wait a minute! When a consumer is forced to accept the permissions on an application they cannot remove without rooting the device and voiding the warranty, the stage is set for a privacy and security threat to the consumer. The application would need to be executed then right? Well, if you check out the applications properties, I’d wager it’s running in the background. So Verizon Uber-Tech, explain to me why I should not be concerned about an application with excessive permissions running actively on my device and I cannot uninstall it? I was told to “trust us”, there is nothing heinous going on to worry about. My FCC case is unresolved. ← Possible Implications of FCRA Actions?